A new collection of materials about the School in the period from 2013 to 2016. 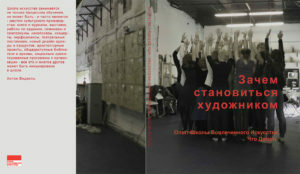 This publication is one of the first attempts to analyze the situation that has developed with the art education in contemporary art in Russia. In addition to the texts of well-known practitioners and theoreticians of contemporary art, the collection includes texts and documentation of projects of students of the School of Engaged Art. Authors of the book: Anton Vidokle, Dmitry Vilensky, Gluklya Natalia Pershina, Nina Gasteva, Nikolai Oleynikov, Jonathan B. Platt, Tsaplya Olga Egorova, Nikita Kadan, Victor Misiano, Matthias Meyndl, Natalia Pankina, Cathy Chukhrov, Tina Farni, Lisa Hoffman and others.